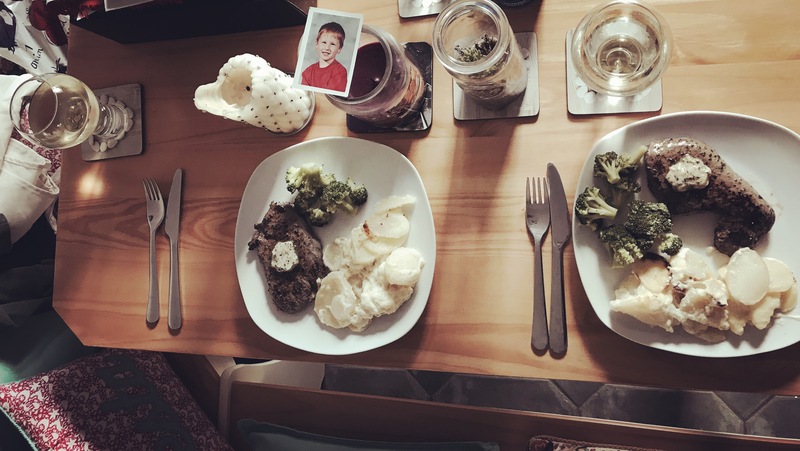 How to do ‘date night’ on a budget! I don’t know about you, but I love being wined and dined in a nice restaurant. Miller and Carter is one of our favourites (Elliott loves a good steak) so if we ever think of going out to dinner, this is where we go. This isn’t a cheap meal, usually it will cost around £70 for the two of us. Thursday, my mum and dad went away for a couple of nights so I thought “Why not make Elliott a really nice meal?, instead of going out I’ll make it myself!” So off I went into town thinking I’d have to spend a fortune on some good pieces of meat (don’t get me wrong, I know the best bits are expensive, but bare with me here). I popped into Tesco for some veg and wine, knowing they always have good deals on the wine. As I walked down one of the isles, I noticed a fridge with some fancy foods in (honestly it was the dessert that caught my eye..) but it was here that I bought our whole meal tonight. Yes it was no Michelin star restaurant, or the most romantic candle light dinner. But it was perfect to me. Tonight I cooked steak with garlic butter, dauphinois potatoes and broccoli with a bottle of white wine and vanilla cheesecake for dessert, and it was perfect. All for £10. What we would have usually spent £70 on in a restaurant I spent £10 on tonight. So, I saved money (Elliotts money), ate a delicious meal in my pyjamas and made no effort. But still had a perfect evening with my other half. Could I have done any better for a Friday night date night on a budget? No, I don’t think I could.